For us any seafood is an essential part of Christmas. These oysters are a favourite. I bought Mahurangi oysters in the half shell as the basis. This sauce is just one suggestion to go with them – a simple dipping sauce of red wine vinegar and finely chopped shallots would be just as good or aioli or even just soy sauce. 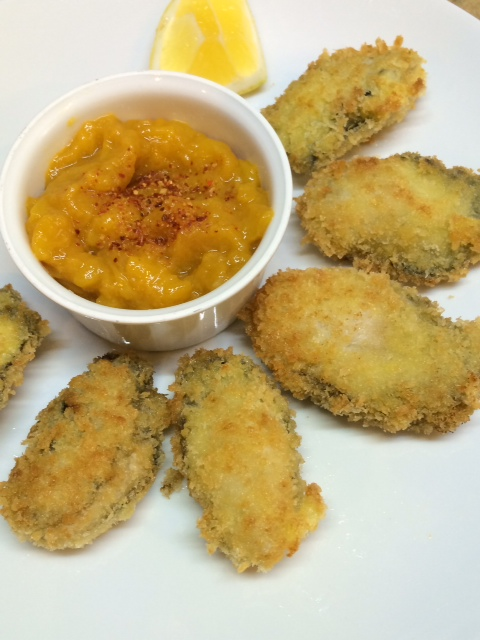 Coat each oyster in flour, shaking off the excess, dip in the egg and roll in the panko crumbs. Set the oysters aside while you make the sauce. Put the mango and ginger in a small pot and simmer gently for 5 minutes. Add the vinegar, soy, Espelette and juice of one lime. Simmer for another 5 minutes. Taste and decide if you want it to be more acidic. If so, add more lime juice. Season. In a large frying pan heat a neutral tasting vegetable oil. It needs to be quite hot as the oysters brown quickly and don’t overcook. Brown the oysters on each side. Serve at once with one or more dipping sauces.